Dietary fat is one of important energy sources . Triglyceride which composed of fatty acids, phospholipid, and cholesteryl esters is abundant in fat-diet . In fasting condition, triglyceride which is stored in adipose tissue is hydrolyzed to free fatty acids and glycerol . Based on carbon number of aliphatic tails, fatty acids categorized as short-chain (< 8 carbons), medium-chain (8-12 carbons), long-chain (16-22 carbons), or very-long-chain (>22 carbons) fatty acids . In general, long-chain fatty acids (>16 carbons) are more abundant than short-chain and medium-chain fatty acids in animal tissues . The transport of fatty acids across cell membrane could occur by passive diffusion, or be facilitated by proteins associated with fatty acid transport, including CD36 (also called fatty acid translocase), fatty acid binding protein (FABP), and a family of fatty acid transporter (SLC27, also called FATP) [5-7]. These long-chain fatty acids are important for various physiological processes, such as inflammation, synthesis of phospholipid and triglyceride [8, 9]. Therefore, these transporter proteins are usually associated with regulation of cell behaviors, including cancer cells. Dysregulated metabolism is a hallmark of oncogenesis . Emerging studies suggest that FABP5 is associated with poor survival and the FABP7-associated signaling pathway enhances cell survival and proliferation in triple-negative breast cancer [11, 12]. CD36 overexpression is associated with cell growth and metastasis in breast cancer cells [13, 14]. There are six members of SLC27 family in mammals (SLC27A1 through SLC27A6). According to the amino acid sequence of the conserved region, the SLC27 family proteins are proposed to bifunctional protein with long-chain fatty acids transport and acyl-CoA synthetase (ACS) activity [15, 16]. Therefore, SLC27 family proteins are also named very long-chain acyl-CoA synthetases (ACSVL) . Currently, the association of SLC27 and tumor cells is not fully understood although the relationship between SLC27 proteins and some human diseases have been demonstrated. SLC27A6 which also named FATP6 and ACSVL2 colocalizes with CD36 . FATP6- 7 T>A polymorphism may protect from human cardio-metabolic diseases . In human intrauterine growth restriction, increased protein expression of CD36 and SLC27A6 is observed in syncytiotrophoblast microvillous plasma membrane . The association between SLC27A6 and malignant cells were not well-known. In our recent study, we found that the expression patterns of SLC27A family proteins were quite different in tumor samples when compared to non-tumor samples . The SLC27A6 expression was the most significantly and inversely associated breast tumor samples in several public microarray datasets. Thus, the aim of the present study was to investigate whether SLC27A6 plays a role in human tumor progression. The function of SLC27A6 was evaluated in tumorigenic and non-tumorigenic breast cells. Human mammary epithelial cell line H184B5F5/ M10 was obtained from Bioresource Collection and Research Center (BCRC Number: 60197) (Hsinchu, Taiwan). H184B5F5/M10 was cultured in alpha- Minimum Essential Medium (α-MEM) with 15% fetal bovine serum (Life Technologies, Grand Island, NY, USA). Human mammary cancer cell line Hs578T, MCF-7, and MDA-MB-231 were purchased from American Type Culture Collection (USA) and were respectively maintained in Dulbecco's Modified Eagle Medium (DMEM), Minimum Essential Medium (MEM), and Leibovitz's L-15 Medium with 10% fetal bovine serum respectively. All culture medium contained (Life, 100 units/mL penicillin G, 100 μg/mL streptomycin, and 0.25 μg/mL amphotericin B Technologies, Grand Island, NY, USA). H184B5F5/M10, Hs578T, and MCF-7 were cultured in 5% CO2 air atmosphere and MDA-MB-231 was cultured at CO2-free air atmosphere at 37°C. 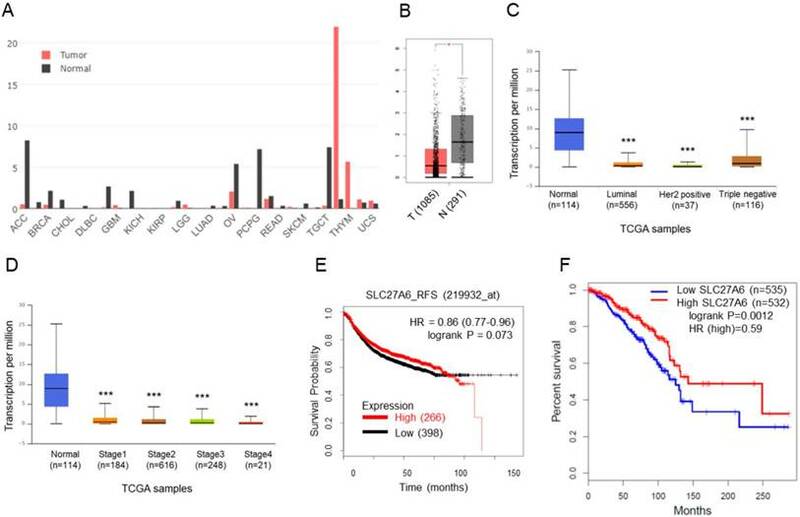 The expression in SLC27A6 in different types of normal and tumor samples and overall survival curve was evaluated by GEPIA database (http://gepia. cancer-pku.cn/) which was established using gene expression data via RNA sequencing from Cancer Genome Atlas (TCGA) and Genotype-Tissue Expression (GTEx) and patient survival . The relapse-free survival (RFS) was evaluated by Kaplan‑Meier (KM) plotter (http://kmplot.com) which was established using gene expression data via Affymetrix microarray expression profiles and survival information from Gene Expression Omnibus (GEO) database  and high‑ and low‑expression groups were divided according to the “median” expression levels. Moreover, the expression of SLC27A6 in different stages and subtypes of breast cancer samples was evaluated by the UALCAN database (http://ualcan.path. uab.edu) . The functional protein association network of SLC27A6 was drawn via in stringAPP (version 1.4.0) in Cytoscape software version 3.6.1 [24, 25]. The biological process annotation was determined by DAVID Bioinformatics Resources 6.7 (https://david. ncifcrf.gov) [26, 27]. Total protein was collected 48 hours after subculture and protein concentration was determined by Pierce BCA Protein Assay Kit (Thermo Fisher Scientific). Protein was separated on 10-15% SDS-PAGE and then transferred to PVDF membranes (Millipore). The PVDF membrane was then blocked with 5% dried skimmed milk in tris-buffered saline with 0.05 % Tween-20 (TBST) buffer for 1 hour. The membrane was hybridized with the primary antibodies including anti-GAPDH (1:5000, Cat. No. #MAB374) which was purchased from Millipore (USA); anti-CDK2 (1:1000, Cat. No. #2546), anti- CDK4 (1:1000, Cat. No. #12790), anti-CDK6 (1:2000, Cat. No. #3136S), anti-cyclin D1 (1:1000, Cat. No. #2978), and anti-p21 (1:1,000; catalog no. 2946) which were purchased from Cell Signaling Technology (USA); anti-SLC27A6 (1:1000, Cat. No. #ab72654) which was purchased from Abcam (UK) at 4 °C overnight. After TBST washing 3 times, the membrane was then hybridized with anti-rabbit IgG or anti-mouse IgG HRP-linked antibody (1:3000, Cell Signaling Technology, USA). The images were acquired on Alpha Innotech FluorChem FC2 imaging system (ProteinSimple; Bio-Techne, Minneapolis, MN, USA). Lentivirus shRNAs were prepared by the RNAi Core Facility (Taipei, Taiwan). The lentivurus-shRNA clones include: Lenti-emptyT (clone ID, TRCN0000089107; vector control); Lenti-shSLC27A6 #19 (clone ID, TRCN0000043419, targeting sequence: 5'- GCTCATTATAATTCGGCTGAA-3', targeting on SLC27A6); Lenti-shSLC27A6 #20 (clone ID, TRCN0000043420, targeting sequence: 5'-CCCATGTCTTCCTGAACCATT-3', targeting on SLC27A6). To silencing the gene expression, the H184B5F5/M10 and Hs578T cells lines were complete culture media containing 8 μg/ml polybrene (EMD Millipore, Billerica, MA, USA) in 6 cm dish at 37˚C for 30 min. Lentiviruses for H184B5F5/M10 and Hs578T were added for infection at multiplicity of infection = 5. The culture medium was refreshed with fresh culture media with 2 μg/ml puromycin (Sigma‑Aldrich; Merck KGaA, Darmstadt, Germany) after 24 hours of incubation. The infected cells then were maintained in medium with 2 μg/ml puromycin for 3-6 generations and used in assays. Before fatty acid uptake assay, 1✕104 H184B5F5/M10 and Hs578T were seeded on a 96‑well plate overnight. The fatty acid uptake was evaluated via the Free Fatty Acid Uptake Assay Kit (Fluorometric) (cat. no. ab176768; Abcam, UK). After phosphate‑ buffered saline (PBS) washing and 1-hour preincubated in serum‑free media, cells were then incubated in a fluorescent fatty acid mixture for 30 minutes. The results were evaluated by using a microplate fluorescence reader at 485/528 nm (FLx800; BioTek Instruments Inc., Winooski, VT, USA). The fluorescence signal from vector control group was set to 100% for relative quantification. ROS levels were evaluated using a DCFDA Cellular Detection Assay kit (Cat. No. #ab113851, Abcam, UK) according to manufacturer's instruction. In 96-well plate, 1✕104 adherent H184B5F5/M10 and Hs578T cells were stained with 100 μl of 20 μM DCFDA solution at 37°C for 45 minutes in the dark. After washing with PBS, the results were evaluated by using a microplate fluorescence reader (FLx800; BioTek Instruments Inc., Winooski, VT, USA) at 485/528 nm. 2-4✕104 H184B5F5/M10 and Hs578T cells were suspended in 100 μl of PBS containing 1% Triton X-100 (Sigma-Aldrich, St. Louis, MO, USA). Cell was mixed on the vortex mixer for 1 minute and then was placed on ice for 30 minutes. After centrifugation at 10,000 ✕ g at 4°C for 15 minutes, the supernatant was collected and then the concentration of triglyceride was analyzed by a Triglyceride Quantification Kit (Cat. No. #ab65336; Abcam, UK) according to manufacturer's instruction. The results were evaluated by using a microplate reader (PowerWaveTM 340; BioTek Instruments Inc., Winooski, VT, USA) at 570 nm. The short-term cell proliferation of H184B5F5/ M10 andHs578T was evaluated by WST‑1 assay (4‑[3‑(4‑iodophenyl)‑2‑(4‑nitrophenyl)‑2H‑5‑tetrazolio]‑1,3‑benzene disulfonate) (Clontech, Mountain View, CA, USA) according to manufacturer's instruction. Before WST-1 assay, 3x103 cells were respectively seeded in 96‑well plates overnight. The culture media were then replaced with 100 μl mixture consisting of 95 μl fresh culture media and 5 μl WST-1 reagent. For 24 and 48 hours incubation, the absorbance at 450 nm was determined on a microplate spectrophotometer (PowerWaveTM 340; BioTek, Winooski, VT, USA). The long-term cell growth was evaluated by colony formation assay. 500 cells were seeded in a 6-well plate with 2.5 ml of fresh culture medium. Cell culture media were replaced every 3 day until 14 days after seeding. Colonies were stained with crystal violet (0.4 g/L; Sigma, St. Louis, MO, USA) and the colony number was counted. 3 ✕ 105 H184B5F5/M10 cells were seeded into 24-well plates. When cells reached a 100 percent confluent monolayer, a scratch was made by a 200 μL pipette tip. Cell debris was washed by phosphate- buffered saline (PBS) washing. Subsequently, the cells were cultured in culture media with 1% FBS for 12 h. The images were captured via a Leica inverted microscope. Migration area was quantitated by TScratch software (version 1.0. Available at http:// www.cse-lab.ethz.ch). H184B5F5/M10 cells were maintained in culture medium and harvested at 48 hours incubation after subculture. Cells were fixed with 70% ethanol overnight at 4°C. After PBS washing, cells were incubated with 1 U/ml of DNase-free RNase A and 5 µg/ml of propidium iodide for 10 min at 4°C in the dark (Sigma-Aldrich, St. Louis, MO, USA). The cell cycle distribution was evaluated on BD Accuri C6 flow cytometer (BD Biosciences). The distribution of G0/G1, S and G2/M phase cells were determined as a percentage of the total number of cells. All graphs and statistics were made by the GraphPad Prism 7 software (GraphPad Software, Inc., La Jolla, CA, USA). To examine statistical difference among all groups, a one‑way analysis of variance (ANOVA) with bonferroni multiple comparison test was used. p<0.05 was considered to indicate a statistically significant difference. The SLC27A6 expression in tumoral and non-tumoral tissues in clinical samples was analyzed through GEPIA database. Higher SLC27A6 was detected in non-tumor tissues when compared with tumor tissue in breast cancer and some types of cancer (Figure 1A and 1B). Furthermore, the expression of SLC27A6 in non-tumor tissue is higher than that in different subtypes and different stages of breast cancer (Figure 1C and 1D) via analysis of UALCAN database. To evaluate whether SLC27A6 expression was associated with survival of breast cancer patients, it was evaluated via two different databases including the Kaplan‑Meier (KM) plotter and GEPIA. The gene expression of KM plotter and GEPIA was determined through Affymetrix microarray expression profiles and RNA sequencing, respectively. The trend toward better relapse-free survival (RFS) and overall survival in breast cancer patients with higher SLC27A6 expression (Figure 1E and 1F, p=0.073 and 0.012, respectively). To further investigate the role of SLC27A6 in vitro, the SLC27A6 expression was evaluated by Western blot assay in an immortal and non-tumorigenic human mammary epithelial cell H184B5F5/ M10 and in different type of breast cancer cell lines, MCF-7, Hs578T, and MDA-MB-231. In Figure 2A, the highest SLC27A6 expression was observed in H184B5F5/M10 and relatively low SLC27A6 expression was observed in Hs578T cells. Thus, the H184B5F5/M10 and Hs578T were chosen for investigating the role of SLC27A6 in non-tumorigenic and tumorigenic breast cells. H184B5F5/M10 and Hs578T cells were transduced with lentivirus short hairpin RNA (shRNA) targeting two different sequence of SLC27A6 (shSLC27A6#19 and shSLC27A6#20). The results showed that the expression of SLC27A6 in H184B5F5/M10 and Hs578T was significantly repressed after transduction of lentivirus shSLC27A6#20 but not shSLC27A6#19. The cell morphology of both cells was not significantly changed after repressing SLC27A6 expression (Figure 2B to 2G). SLC27A6 is a bifunction enzyme with long-chain fatty acids transport and acyl-CoA synthetase (ACS) activity [15, 16]. ACS enzyme activity is associated with acyl-CoA metabolic pathways including β-oxidation and triglyceride synthesis . Therefore, the fatty acid uptake capacity, reactive oxygen species (ROS) level, and intracellular triglyceride concentration were determined in both cell lines. Our results revealed that the fatty acid uptake capacity was inhibited in H184B5F5/M10 with lentivirus shSLC27A6#20 group. By contrast, there was no significant difference among all groups in Hs578T (Figure 3A). In addition, repressing SLC27A6 did not alter the ROS level and triglyceride concentration in H184B5F5/M10 and Hs578T (Figure 3B and 3C). To investigate whether SLC27A6 expression level affects cell growth in non-tumorigenic and tumorigenic breast cells, the WST-1 assay and colony formation were performed. In H184B5F5/M10, slower cell growth was observed in the shSLC27A6#20 group when compared to vector control and parental groups (Figure 4A and 4B). However, the cell growth of Hs578T was not altered by repressing SLC27A6 expression (Figure 4C and 4D). Because long-chain fatty transport is associated with metastasis, the cell migration capacity was evaluated by wound-healing assay. The results showed that silencing SLC27A6 did not significantly affect cell migration of H184B5F5/ M10 (Figure 4E and 4F). Therefore, the effect of growth inhibition is associated with silencing efficiency of SLC27A6 in non-tumorigenic breast cell. Because cell growth of H184B5F5/M10 was affected by SLC27A6 repression, the cell cycle status was analyzed via the propidium iodide staining assay on flow cytometry. In Figure 5A and 5B, the results showed that increasing cell population in G0/G1 phase and decreasing cell population in S phase in the shSLC27A6#20 group. The protein expression of cell cycle regulator including cyclin D1, cell division protein kinase 4 (CDK4), and CDK6 is relatively low in the shSLC27A6#20 group when compared to the control group. The expression of CDK4 and p21 which was a cell cycle inhibitor was not significantly changed (Figure 5C and 5D). The result might imply the low expression of these cell cycle regulators is associated with low SLC27A6 expression. The SLC27A6 protein-associated network was analyzed via STRING database. In Figure 6A, the SLC27A6-associated proteins including ACSL1, AWAT1, CD36, DGAT2, FABP3, FASN, INS, LSS, ZDHHC3, and ZDHHC7 was shown. The full name of each protein was listed in Table 1. The biological process of these genes was performed through DAVID Bioinformatics Resources (Table 2). These genes involve in the process of lipid biosynthesis, fatty acid metabolic process, and fatty acid transport, etc. In addition, the function of ZDHHC3 and ZDHHC7 were related to palmitoyltransferase activity and protein-cysteine S-palmitoyltransferase activity which play important role in the process of fatty acid oxidation . 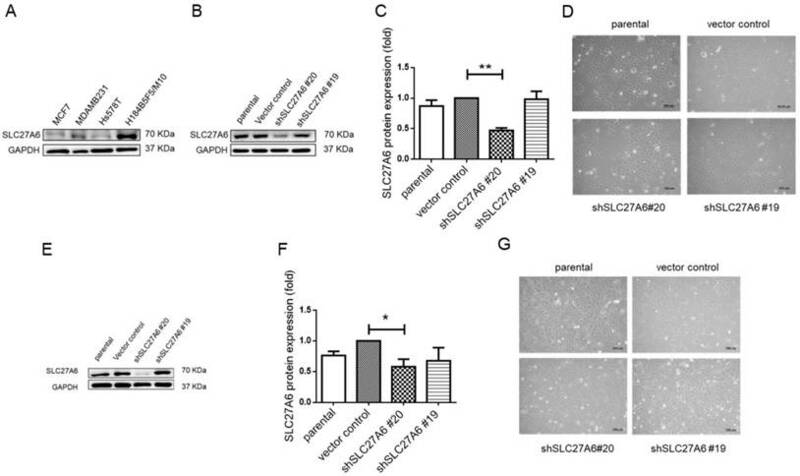 Thus, repressing SLC27A6 expression might significantly affect lipid metabolic pathways in non-tumoral breast cells. The summarized graph of the present study was shown in Figure 6B. Breast cancer is one of the most threatening disease . Fatty acids are demonstrated to affect the behaviors of breast cancer cells. Activation of short-chain fatty acid receptors via short chain fatty acids indices mesenchymal to epithelial transition which drives cells toward non-invasive phenotypes in breast cancer cells . In addition, recent studies suggest that the long-chain fatty transport is related to metastasis and proliferation of breast cancer cells [11-14]. Thus, SLC27 family proteins might also play a role in breast cancer progression. Interestingly, our bioinformatic analysis revealed that SLC27A6 expression in non-tumoral tissue was higher than that in tumoral tissue in clinical samples. We suppose that low SLC27A6 expression in tumoral tissue might be associated with the specific substrate preference of SLC27A6. Unsaturated fatty acid, oleic acid (C18:1), arachidonic acid (C20:4), and saturated fatty acid, lignoceric acid (C24:0) are known substrate of SLC27A6 . The antitumor effect of oleic acid was reported in several types of cancer . In breast cancer, oleic acid treatment results in induction of apoptosis and suppression of proliferation . 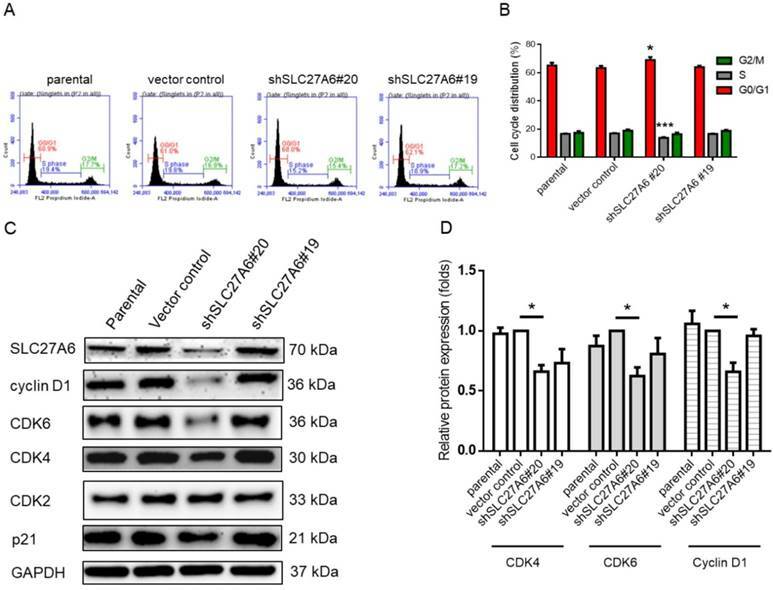 Therefore, attenuation of SLC27A6 expression might be beneficial for cancer cells although arachidonic acid metabolic pathways are linked to inflammation, angiogenesis, tumor proliferation and metastasis . A further investigation for the regulatory mechanism of SLC27A6 expression between tumoral and non-tumoral breast cell is necessary. Note: The subset “GOTERM_BP_FAT” of biological process in gene ontology analysis was performed. Similar expression pattern of SLC27A6 was observed in non-tumorigenic H184B5F5/M10 and breast cancer cell lines. Because H184B5F5/M10 is derived from primary mammary cells, the Hs578T which is derived primary tumor was chosen for following experiments [33, 34]. Repressing SLC27A6 leads to decrease fatty acid uptake capacity, inhibit cell proliferation, and delay cell cycle in H184B5F5/ M10. CDK4, CDK6, and cyclin D1 expression decreased in SLC27A6-silencing H184B5F5/M10. Except to lipid metabolism, long-chain fatty acids serve as ligands of peroxisome proliferator-activated receptors (PPAR), nuclear receptors including retinoid-X receptor (RXR), liver-X receptor (LXR), hepatocyte nuclear factor 4 (HNF4), and free fatty acid receptors (FFAR) which regulate downstream metabolic pathways such as β-oxidation, ketogenesis, and triglyceride synthesis . Therefore, the ROS and triglyceride levels in H184B5F5/M10 was determined; however, the levels were not significantly changed after repressing SLC27A6. We speculate that the knockdown of SLC27A6 might alter uptake of some specific long-chain fatty acids which is essential for H184B5F5/M10 proliferation, and might not significantly alter cellular pool of long-chain fatty acids because the other transport proteins compensate the effect of SLC27A6 silencing. The specific fatty acids-mediated by SLC27A6 might affect the regulation of CDK4, CDK6, and cyclin D1. CDK4 can regulate cell cycle and metabolism. The CDK4- pocket protein retinoblastoma (pRB)-transcription factors E2F1 pathway participates in metabolism control such as glucose homeostasis and fatty synthesis through modulation PPARγ . A recent study demonstrates that CDK4 inhibits fatty acid oxidation via modulation of AMP-activated protein kinase (AMPK) . The detailed regulatory mechanism between cell cycle regulators and specific fatty acids is worthy of future investigation. By contrast, Hs578T expresses relatively low level of SLC27A6. Repression of SLC27A6 did not affect phenotypes of Hs578T. We suppose that the other members of SLC27 family protein and other fatty acid transporter proteins might compensate the effect of SLC27A6 repression. SLC27A4 is another member of SLC27 family and our recent study demonstrates that high expression of SLC27A4 is associated with breast cancer tissues . When SLC27A4 was silenced, the proliferation, migration, and invasion of Hs578T were suppressed . Thus, the result might suggest that SLC27A6 plays a minor role in progression of breast cancer. Currently, the interaction between SLC27A6 and other proteins is not fully-understood. Therefore, the functional protein association networks were evaluated by STRING database. According to the analysis, repressing SLC27A6 might affect several lipid metabolic pathways including lipid biosynthesis, transport, and β-oxidation, etc. Thus, SLC27A6- silencing should affect the other cellular metabolic pathways. Blocking fatty acids, increasing fatty acids degradation, increasing fatty acids storage in neutral triglyceride, and decreasing fatty acids from triglyceride storage are potential strategies to reduce tumor cell proliferation . Therefore, silencing SLC27A6 might disturb multiple lipid metabolic pathways and cell cycle regulation even though H184B5F5/M10 is a non-tumorigenic cell line. 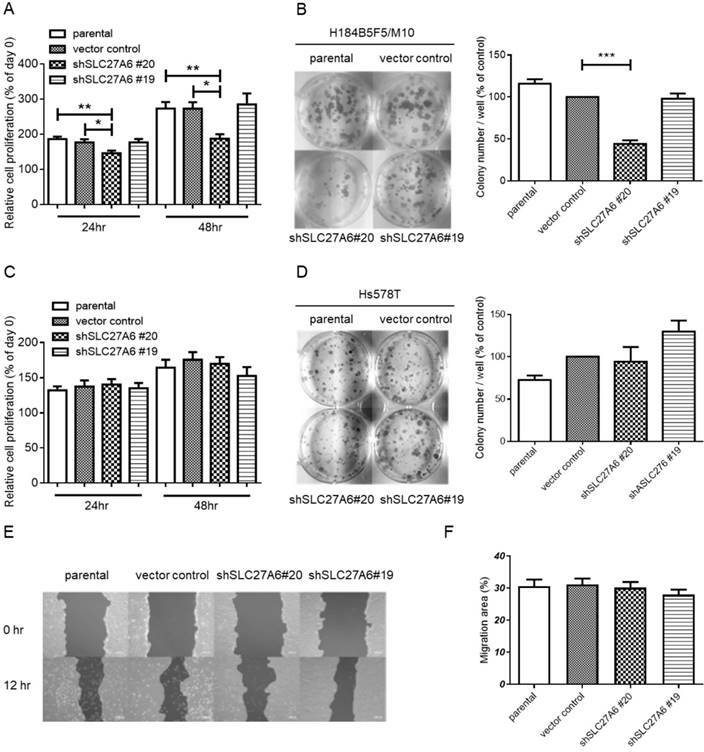 Although H184B5F5/M10 and Hs578T could not fully reflect physiological non-tumoral and tumoral breast tissues, this study still reveals that inverse correlation between SLC27A6 expression and tumoral tissues and provides a new insight into SLC27A6- mediated cell growth and cell cycle regulation in non-tumorigenic breast cells. This study was supported by grants from the Ministry of Science and Technology (MOST 104-2314- B-037-053-MY4; MOST 105-2314-B-037-037-MY3; MOST 106-2314-B-037-046; MOST 106-2320-B-037-029- MY3), the Kaohsiung Medical University Hospital (KMUHS10701; KMUHS10712; KMUH106-6R34; KMUH106-6R77), and the Kaohsiung Medical University (KMU-DK108008). The authors thank the Center for Research Resources and Development of Kaohsiung Medical University.